Thomas Tompkins, or Thompkins, was born in Yeovil in August 1892, the youngest of the six children of glove cutter Henry Thompkins (b1850) and Mary Ann née Rogers (b1851). Henry and Mary's children were George (b1875), Flossie (b1882), Henry (b1885), Mabel (b1887), Oliver (b1890) and Thomas. All the children were born in Yeovil. In the 1901 census the family were living in 43 Reckleford, at which time Thomas was only aged 9. The family were at the same address in the 1911 census and 19-year old Thomas gave his occupation as a glove cutter. He worked for William Tucker in his glove factory on Reckleford. The family later moved to 16 Alexandra Road. In the summer of 1915 Thomas married Emily May Giles at Yeovil. They were to have a daughter, Dorothy May, born later that year. Thomas enlisted at Yeovil on 13 September 1916 and initially joined the Cambridgeshire Regiment with the Service Number 8156. He was soon transferred to the 7th (Service)Battalion, Queen's Own (Royal West Kent Regiment) with the new Service Number 205182. The 7th Battalion, in 55th Brigade 18th Division, had been fighting in France since July 1915. The first engagement in which Thomas saw action would have been between 26 and 28 September 1916, when the 7th Battalion became embroiled in the Battle of Thiepval Ridge, a battle within the Somme Offensive. The battle was fought on a front from Courcelette in the east, near the Albert–Bapaume road to Thiepval and the Schwaben Redoubt in the west, which overlooked the German defences further north in the Ancre valley, the rising ground towards Beaumont-Hamel and Serre beyond. Thiepval Ridge was well fortified and the German defenders fought with great determination. The attack on 26 September was a mixed success. On the right, the Canadians captured their limited objectives in the first attack. On the left, the 34th Brigade of the 11th Division suffered very heavy losses and failed to make any real progress. In comparison the 33rd Brigade suffered 600 casualties; most of them wounded, and took most of their objectives. After just a few days respite the 7th Battalion fought in the Battle of the Ancre Heights from 1 October to 11 November 1916. Between 1 and 8 October the Canadian Corps assaults on Regina Trench witnessed brutal fighting, heavy casualties and temporary limited occupation of the objective. Canadian attempts on 23 October further to extend their occupation of Regina Trench were frustrated by mud and heavy enemy fire. It was not until 10 November, after days of rain, that a surprise midnight assault finally secured the eastern portion of this position. The Battle of the Ancre represented the end of the Battle of the Somme, including Ancre Heights, and concluded with the capture of Beaumont Hamel, St Pierre Divion and Beaucourt. The 7th Battalion was next fighting a series of actions known as the Operations on the Ancre that lasted from 10 January until March 1917. After the Battle of the Ancre (13–18 November 1916), British attacks on the Somme front were stopped during inclement weather and until early January 1917 military operations by both sides concentrated on surviving the rain, snow, fog, mud fields, waterlogged trenches and shell-holes. British operations on the Ancre from 10 January to 22 February 1917, forced the Germans back five miles (8.0 km) on a four mile (6.4 km) front, and eventually took 5,284 prisoners. On 22/23 February, the Germans fell back another three miles (4.8 km) on a fifteen mile (24 km) front. The 7th Battalion were involved in The German retreat to the Hindenburg Line during early 1917 and saw action in the Third Battle of the Scarpe, the last of the Battles of Arras, 1917, which opened on 3 May. The French had planned a heavy attack on Chemin des Dames to take place on the 5th and, in order to distract the attention of the enemy and hold his troops east of Arras, Sir Douglas Haig considerably extended his active front. While the Third and First Armies attacked from Fontaine-les-Croisilles to Fresnoy the Fifth Army was to launch a second attack upon the Hindenburg Line in the neighbourhood of Bullecourt - a total of over 16 miles. Zero hour was timed for 3:45am on 3 May. After a period of relative calm, the 7th Battalion was engaged in another battle, the Battle of Pilkem Ridge. This battle was the opening attack of the Third Battle of Ypres, which later became known as Passchendaele. The battle began at 3:50am on 31 July 1917, when 2,000 Allied guns opened fire on German lines and 14 British and two French divisions attacked along 15 miles of the Front. On the afternoon of 31 July, rain began to fall on the battlefield. Over the following days the shell-damaged ground became a quagmire, severely hampering the advancing troops, and making the movement of artillery, casualties and supplies very difficult. After three days, the Allied advance was half of what had been planned. The British Army had suffered some 27,000 casualties wounded, killed and missing. Most of the dead have no known grave. The following month the 7th Battalion became embroiled in the Battle of Langemarck. from 16 to 18 August 1917. This was the second Allied general attack of the Third Battle of Ypres. The Allied attack succeeded in the north, from Langemarck to Drie Grachten ("Three Canals") but early advances in the south on the Gheluvelt Plateau were forced back by powerful German counter-attacks. Both sides were hampered by rain, which had a greater effect on the British who occupied lower-lying areas and advanced onto ground which had been frequently and severely bombarded. The next major action involving Thomas and the 7th Battalion was the First Battle of Passchendaele, which took place on 12 October 1917 in the Ypres Salient of the Western Front, west of Passchendaele village, during the Third Battle of Ypres. The Allied plan was to capture Passchendaele village. This was based on the incorrect assumption that during the Battle of Poelcappelle, three days previous, the attacking troops had captured the first objective line. In fact, the Allied front line near Passchendaele had hardly changed and the true position of the Allied front line, meant that the planned advance of 1,500 yards (1,400 m) was actually 2,000–2,500 yards (1,800–2,300 m). The assault was directly south of the inter-army boundary between the British Fifth and Second Armies and consequently pitted a collection of formations from both armies against the German Fourth Army. Despite advances on the northern front of the battlefield, the German's retained control of the high ground on Passchendaele Ridge and consequently the attack failed in attaining its principal objective. Although the battle was costly to both sides, the battle was considered a German defensive success. Further British attacks were postponed until the weather improved and communications behind the front had been restored. The Second Battle of Passchendaele was the culminating attack during the Third Battle of Ypres. The battle took place in the Ypres Salient area of the Western Front, in and around the Belgian village of Passchendaele, between 26 October and 10 November 1917. The battle began at 5.40am on 26 October, with artillery shells raining down on the German positions while the infantry advanced: the Canadians at the centre of the attack facing Passchendaele, British and Australian units to their left and right. Progress was slow in the deep mud, but the attackers made modest gains and held on against German counter-attacks. On the morning of 30 October a second effort was launched to capture Passchendaele. Again the attackers met with heavy German resistance, and the ground gained was still short of the final objectives. A final advance began on 10 November, with British and Canadian troops attacking into a heavy rainstorm to secure ground to the north of the village and consolidate their positions. In 1918 the 7th Battalion were in action in the Battle of St Quentin (21-23 March 1918). The Battle of St Quentin began the German's Spring Offensive on 21 March 1918. It was launched from the Hindenburg Line, in the vicinity of Saint-Quentin, France. Its goal was to break through the Allied lines and advance in a north-westerly direction to seize the Channel ports, which supplied the British Expeditionary Force (BEF) and to drive the BEF into the sea. Two days later General Ludendorff, the Chief of the German General Staff, changed his plan and pushed for an offensive due west, along the whole of the British front north of the River Somme. This was designed to separate the French and British Armies and crush the British forces by pushing them into the sea. The offensive ended at Villers-Bretonneux, to the east of the Allied communications centre at Amiens, where the Allies managed to halt the German advance; the German Armies had suffered many casualties and were unable to maintain supplies to the advancing troops. Much of the ground fought over was the wilderness left by the Battle of the Somme in 1916. The action was therefore officially named by the British Battles Nomenclature Committee as The First Battles of the Somme, 1918. The Battle of the Avre (4–5 April 1918), part of the First Battle of Villers-Bretonneux, constituted the final German attack towards Amiens and was yet another major action involving the 7th battalion.. It was the point at which the Germans got the closest to Amiens. It was fought between attacking German troops and defending Australian and British troops. The attack was an attempt to take Amiens, where other aspects of Operation Michael had failed. The Avre marked the beginning of the end for Ludendorf's March Offensive. The Second Battle of Villers-Bretonneux took place from 24 to 25 April 1918, during the German Spring Offensive, against the Allied lines to the east of Amiens. It is notable for the first major use of tanks by the Germans, who deployed fourteen of their twenty A7Vs and for the first tank-versus-tank battle in history. Although primarily known as a tank battle, infantry including the 7th Battalion were involved. By 25 April, the town of Villers-Bretonneux had been recaptured. The battle was a great success for the Allies, who had defeated the German attempt to capture Amiens and recaptured Villers-Bretonneux while outnumbered; the village remained in Allied hands to the end of the war. Nevertheless, heavy fighting continued for several weeks after the main battle and on 25 May 1918, Thomas Tompkins was killed in action. He was just 26 years old. 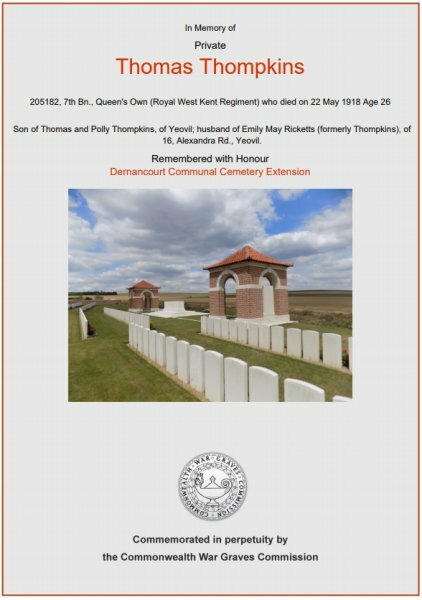 The Western Gazette, in its edition of 14 June 1918, reported "Mrs ME [sic] Thompkins, of Alexandra Road, has received official information from the War Office, that her husband, Private T Thompkins of the Royal West Kents, was killed in action on 22nd May. Before joining up Private Thompkins was employed as a glove cutter at Mr Tucker’s factory in Reckleford, and had been in the Army a year and eight months, 12 months being spent in France. The deceased leaves a widow and one child." (Emily re-married at Yeovil in the winter of 1919 to Albert G Ricketts). Thomas was interred in Dernancourt Communal Cemetery Extension, Somme, France. Grave VI.H.3. and his name is recorded on the War Memorial in the Borough. The Commonwealth War Graves Commission certificate in memory of Thomas Thompkins.